¡NPR now has an entire program dedicated to the music I love! Wherever I travel, I ask a local person who is interested in music to go to a CD shop with me, and to show me what is current and interesting. The store clerks usually love to get involved, and I get to sample a wide variety of exciting music. Technology is lowering the barriers to producing music, so an amazing variety can be found. I look for music that people are actually listening to, and that I can somehow connect to music I have already heard. It is great fun! Most of the CDs for which no link to Amazon.com is provided were purchased in Latin America, in one case directly from the artists, but one benefit of globalization -- and world music activism -- is that you can support many of these artists by purchasing their work online. I am providing links wherever possible to facilitate this support. In some cases I am providing short clips, or links to clips that already are online. In all cases, these clips are limited to 30 seconds, which is the maximum for what is considered educational "fair use." If you like the clips, buy the CDs! Most of what I have learned has come from listening to the CDs in their entirety many times. I often understand only a few words the first time, but my ear and brain eventually become attuned. Sometimes I am pleasantly surprised by a discovery in a song I have heard dozens of times. Although Amazon.com is the most convenient source for much of this music, I also encourage you to consider supporting one of the specialized online stores listed at the bottom of this page -- or your local music store if you are lucky enough to have one. Thanks to Kelli Bennett for her help in preparing this page, to Jacqie Lourenco and Andrea Peters for ongoing technical support, and to the many students and educators who have encouraged this work. Most of all, thanks to my friends in Brazil, Texas, and elsewhere who have helped me to find the coolest music! I am just starting to put some Latin music on my YouTube channel -- both the MaCIE list mentioned above and other groups of videos by category. Go to the channel and explore all the play lists. The Greater Boston area has a lot of live Latin music and dance events. Go to Viva411.com to see what is coming up, and to get email updates. 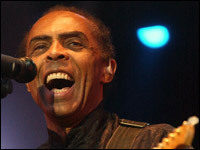 Gilberto Gil is a national treasure and the Minister of Culture in Brazil. We were thrilled to hear him live at the Zeiterion in New Bedford on March 21, 2007. 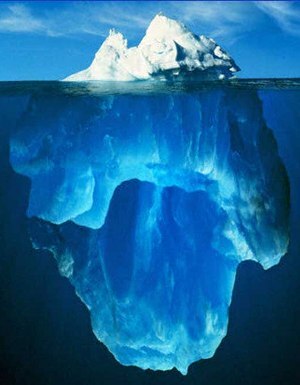 This iceberg is a reminder that whatever we may learn from music, food, or dress, a great deal more remains below the surface. We gain a deeper understanding if we use the music or other surface features of a culture as a point of entry -- a beginning of dialog. Thanks to Ambrizeth Lima for this insight! 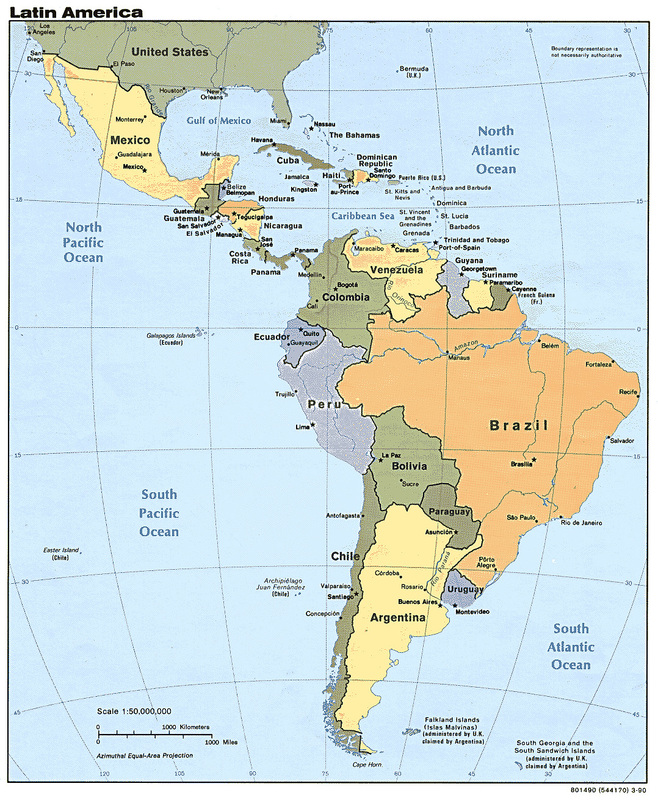 Scholars are not in agreement about what is meant by the phrase "Latin America." 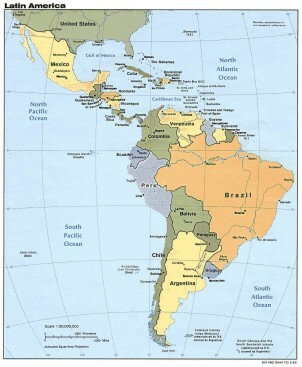 Some include only Spanish & Portuguese-speaking countries, while others exclude the island nations of the Caribbean. I use the term very broadly, to include all of Middle America, South America, and the Caribbean, as well as border areas of the United States in which linguistic and cultural influences are both long-standing and growing. Although I am interested in learning whatever I can about the music of this entire region, I have the most experience with the music of the places I know most directly: the U.S.-Mexico borderlands, Brazil, and Cuba. ¡ Con Salsa ! is a great resource for people in the Boston area. Sunday mornings from midnight to 5:00 a.m., host José Massó plays the best of Afro-Cuban music, Salsa, Latin-jazz, Merengue, Nueva Trova and World Music. Listen online or at 90.9 FM in the Boston area. The family of Daniel Pearl honors his commitment to cross-cultural communication through the annual Daniel Pearl World Music Days . Learn more from the resources provided by the librarians at LANIC! Putumayo is a remote region of Colombia, where the lives of innocents are torn by civil war. It is also the name of an amazing organization that makes the musics of the world available to a worldwide audience. 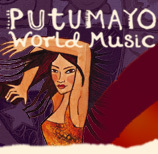 It was from a Putumayo CD display at a shopping mall in Managua that I learned globalization can mean bringing music of the Global South full circle -- it is not just another post-colonial commodity to be enjoyed in the North. Following his success with the Talking Heads, my hero David Byrne founded Luaka Bop, one of the first record labels to seek out unrecorded artists from around the world, and to release compilations, each focused on a carefully-researched genre within a region. 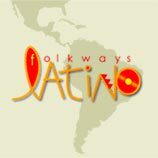 Smithsonian Folkways has long been known for its well-researched collections of music throughout the world. The Latin music section now has well over 100 CDs, and the entire collection is being made available as CDs or as 99-cent downloads by individual track! 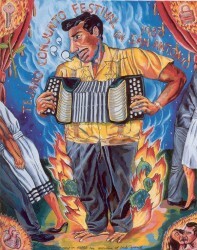 For much more beyond music, see the Smithsonian Latino Center. Note to educators: This web site is a supplement to live presentations that I have enjoyed presenting for college audiences, teacher training, and K-12 assemblies. Please contact me to discuss the possibilities of a presentation at your school, conference, or university. My collection of resources is much larger than that presented here; I can customize a presentation to suit your group's needs. I was honored to have been chosen as the MaCIE Lecturer for the 2006-2007 academic year by the Massachusetts Council for International Education. I have been giving a presentation entitled "The Cultural Geography of Contemporary Music in Latin America" at colleges throughout the state.The partial play list provided background about some of the music I share, and some of the music I do not get to during the presentations. The YouTube version of the play list enhances the experience further, drawing on many creative interpretations of the music. Your campus? The repertoire is always growing!